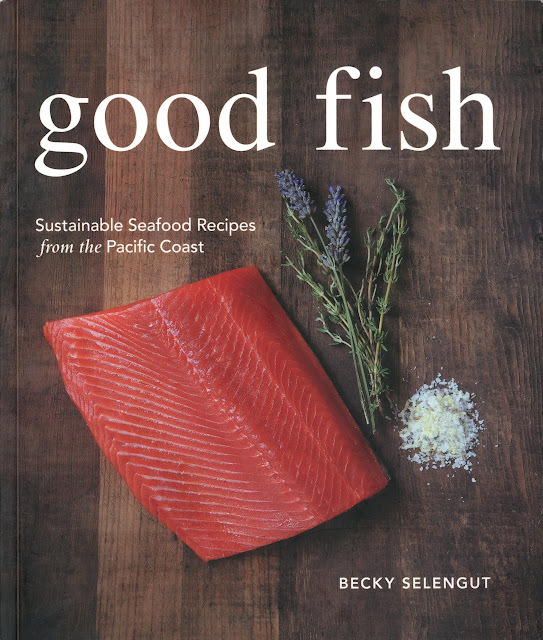 Becky Selengut’s new seafood compendium, “Good Fish: Sustainable Seafood Recipes from the Pacific Coast,” reeled me right in. But I’m an easy catch because I know Becky. And what I know is this: She’s a Seattle chef with an aversion to garlic that rivals Count Dracula’s (she’s allergic); an entertaining instructor whose popular cooking classes regularly sell out; an engaging writer and irreverent blogger; and a staunch sustainable-seafood advocate intent on teaching you how to be “good” by choosing seafood raised and harvested mindfully and ethically. Whether you’re a fish fanatic who owns a copper poaching pan and knows your fishmonger by name, or a seafood scaredy cat who hears the soundtrack from “Jaws” at the mere thought of buying — let alone cooking — a live Dungeness crab, “Good Fish” deserves a spot in your kitchen. What’s more, the book’s online component, a series of how-to videos, is a show-and-tell that will have you shucking oysters, deveining shrimp, caramelizing scallops and pulling pin bones from a salmon like a pro. Q: OK, let’s talk dollar signs. Good fish packs a wallet wallop, and that can be a deal-breaker, right? A: When people think “sustainable,” they automatically think “expensive,” but it’s surprising to learn how inexpensive some really great sustainable seafood can be. A third of the seafood I use in my book is affordable for families on a budget: clams, mussels, Idaho farmed trout, squid and “littlefish” like fresh and canned sardines. Q: ‘Tis the season for salmon, when aficionados spend nearly $40 per pound — even more, per restaurant plateful — for Alaska’s vaunted Copper River kings. What do you recommend for salmon lovers looking for value and affordability? A: If you like salmon with some fat in it, wait for coho season, June through November. The real bargain is knowing how to cook the lean types — wild-caught pinks and chum, which sell for $4.99 to $6.99 per pound. I suggest using those in curries, chowders and stews, simmering the salmon briefly. You can also retain moisture by baking the fish in parchment packages or steaming it in banana leaves [available at Asian markets]. Q: Quick-hit do’s and don’ts? A: It’s important to eat a diversity of seafood — not just salmon, tuna and shrimp. Limit the amount on your plate: You don’t need to serve half-pound portions. Be careful where you shop. 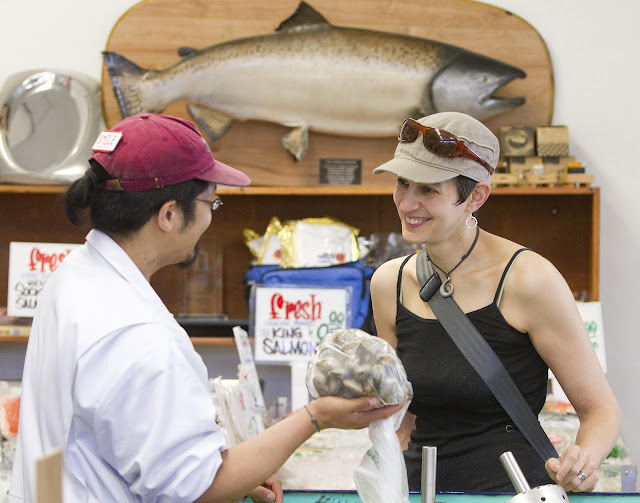 [Becky’s picks: PCC, Mutual Fish, Wild Salmon Seafood Market, University Seafood & Poultry.] Whenever you can, buy direct from fishermen and their families, at the dock or farmers markets: They know what they’re talking about, and they have pride in their product. Buying and eating farmed shellfish is one of the easiest and best choices we can make in this region. Stop eating imported fish. Eat domestic. If you forget everything else, just do that. Q: I always keep Old Bay seasoning on hand — a classic seafood spice. You? A: I’ve got a recipe in the book for fennel salt that takes three seconds to make. You buzz it in a spice grinder (1 tablespoon dried fennel seeds, 1 teaspoon kosher salt and 1/2 teaspoon black peppercorns) and you can make extra and keep it in a jar. 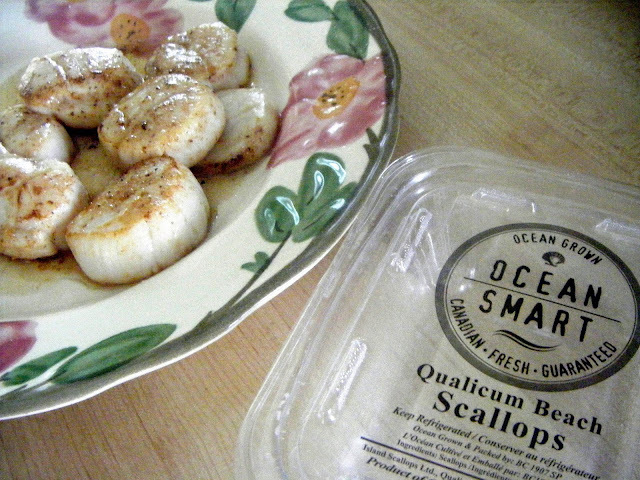 I use it on everything: shrimp, scallops, fish. Just throw it all over the place, it’s really good stuff. Q: What was the most surprising thing you learned while researching “Good Fish”? Q: “Good Fish” is meant to appeal to seafood lovers, but what do you say to people who insist they don’t like seafood? You know: the ones who claim “fish is too fishy”? A: I think people have a warped idea of what they should accept for good quality. Fishy? I wish that word would go away, because quality fish never smells bad. With just a few exceptions, including scallops — which have a distinctly sweet smell — fish should smell like nothing but a light, pleasant, ocean-y breeze. Q: In your introduction, you write, “This book isn’t about what you shouldn’t do. 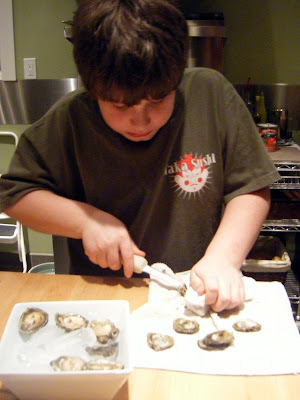 It’s a celebration of what you can do.” So tell me: What can we do to celebrate seafood? A: We can start by being more positive about the seafood bounty available to us, and recognize that as consumers we have power to do things right. There’s no good reason for people living in the Pacific Northwest to be eating species that are in trouble.